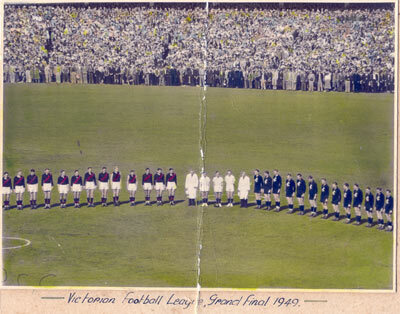 After the disappointment of missing out on the finals in 1948 Carlton would improve in 1949 to contest finals football and make the Grand Final. This suggests that, like 1946, our poor performance in 1948 might have been due to a premiership hangover. The Blues would make a great start to the season, winning 8 of their first 9 games to put the club on top of the ladder, a game in front of Collingwood. The only loss, in round 2 was by a solitary point against Fitzroy. Consecutive losses to Melbourne and Fitzroy in rounds 10 and 11 were a minor hiccup, but with 8 and 5 point margins respectively no major cause for concern. This dropped the club to second on the ladder, but a round 12 win against South Melbourne would put Carlton back on top of the ladder. In fact, from round 12 the club won 5 of 7 games, to lead into a first versus third battle against North Melbourne in the final round of the season. North would go on to defeat the Blues by 56 points, to jump to first spot on the ladder at the end of the home and away season, pushing Carlton down to second. The club was probably unlucky not to have claimed the minor premiership, 4 of its 6 regular season losses being by 8 points or less. North Melbourne and Carlton would meet again in the second Semi Final with the Blues overcoming a 14 point three quarter time deficit to beat North Melbourne by 12 points, although with 18 shoring shots to 21 the margin should probably have been more. North would lose to reigning premier Essendon in the Preliminary Final, setting up a Carlton versus Essendon Grand Final. After a competitive first quarter, the Bombers would march away with the game, to win by 73 points (18.17 125 to 6.16 52). This Grand Final would mark the start of our longest stretch between Grand Finals, and it would be 13 years until we met the Essendon again in the 1962 Grand Final. The 1950's were to become a barren time for the Blues. Leading Goal-kicker: Ken Baxter - 46 goals. Baxter was our leading goal-kicker for 5 years in a row from 1946 to 1950. U19's: Carlton won back to back Under 19's Premierships in 1949 after the first for the club in 1948. The Daily News (Perth) 27 Sept. 1949 reported Carlton's membership was 8120, "the greatest membership of any Australian club." Contributors to this page: Jarusa , molsey , Bombasheldon , blueycarlton , PatsFitztrick , timmyd , BlueWorld , WillowBlue , wolfister , steve and admin . Page last modified on Tuesday 30 of June, 2015 18:38:45 AEST by Jarusa. 1992 - Peter Motley on a full road to recovery (Feb 92).